MEDICOM Technologies, Inc., a purveyor of technically advanced medical identification solutions, has introduced a multimedia-enabled interactive medical wristband. The device readily presents an individual’s complete medical history to emergency treatment personnel in critical situations. 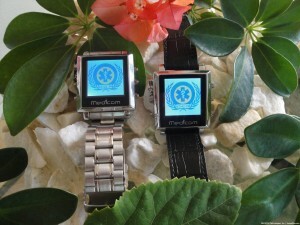 The first-of-its-kind, patent-pending MEDICOM Medical I.D. Wristband could be an industry game changer, boasting an array of audio, video and voice-driven health and entertainment features that the company says is unsurpassed in today’s marketplace. All in a stylish wristband design. Created for the 65 million Americans with chronic medical conditions requiring regular physicians’ care, the computerized MEDICOM Medical I.D. Wristband is described as the first and only device with audio-visual capabilities that can store, display, edit, voice and transfer a patient’s complete medical history in up to nine languages to first responders, EMT’s, and hospital personnel in any emergency medical situation. For non-emergency use in leisure time, consumers may also view photos or listen to songs, voice recordings, 20 FM radio stations, or watch movies via earphones that plug directly into the device. With a touch of a button the wristband’s graphic 1.5” LCD screen with digital display presents, in a scrolling fashion, comprehensive health data automatically pre-parsed into 14 intuitive files that may be individually selected, scrolled in either direction, and paused for easy viewing. The information can also be uploaded from the wristband to an ambulance lap top or hospital computer via a standard USB 2.0 cable connection. Available in two styles – stainless steel or black leather – its fashion accessory design removes the stigma often associated with medical I.D. devices, thus encouraging more self-conscious and style-savvy adolescents and adults with chronic pre-existing medical conditions to wear one and have it at-the-ready when an emergency presents. Also more affordable than other medical identification solutions on the market that charge recurring annual fees, the MEDICOM Medical I.D. Wristbands sell for an economical one-time charge of $125 for the stainless steel banded model or $115 for the leather banded model. The company points out that other, lower-tech medical I.D. products do provide patient information as readily, requiring emergency or hospital personnel to spend precious minutes calling an 800-number for basic medical history and instruction, and presumes that there will be no problems with the I.D. number transfer, telephone connection, or the data access computer at that critical time. From any Internet-enabled computer, consumers may enter from 2GB to 8GB of vital medical, personal, and entertainment information via an intuitive Web site template, and then transfer the data to the MEDICOM Medical I.D. Wristband via a standard USB 2.0 cable/port connection. The MEDICOM Medical I.D. Wristband will store and, at the touch of a button, instantly display a user’s personal demographics; medical conditions; emergency contact information; all medications, dosages and times taken; advance directives and special treatment requests; x-ray disks and recent medical/lab results; medical/dental Insurance information; I.D. photo, allergies; physicians and pharmacy addresses and phone numbers; medical history including any diseases, surgeries, immunizations, etc. ; as well as a miscellaneous folder to input medical appointments, notes, and virtually any additional medical information of note (charting & graphing, diet/exercise programs, Web favorites, etc). Updates and edits to keep personal data current and accurate are also done at the push of a button. In addition, any medical data can be downloaded to the MEDICOM Medical I.D. Wristband from any physician’s office, laboratory, medical or other relevant facility in the world via any Internet-enabled computer. 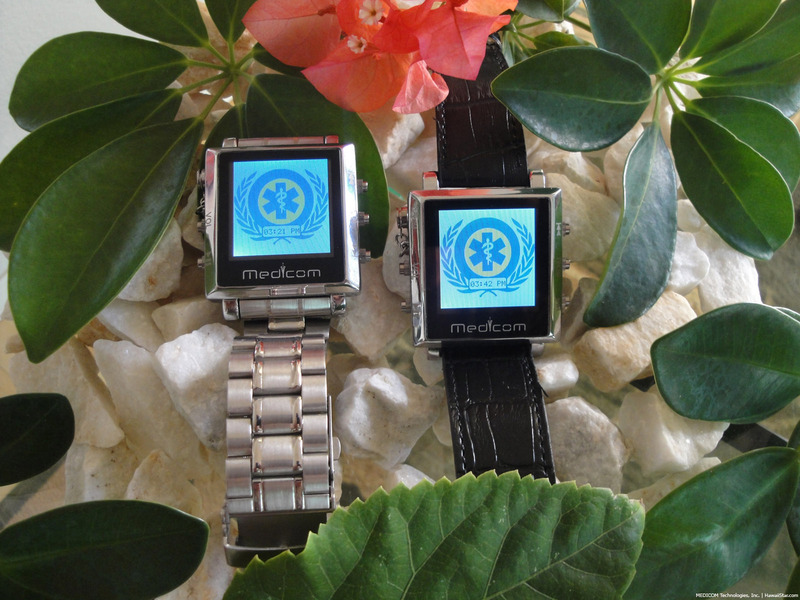 Based in Honolulu, Hawaii, MEDICOM Technologies, Inc. is a purveyor of technically advanced medical identification solutions. Its flagship, patent pending MEDICOM Medical I.D. Wristband presents a patient’s complete medical history to emergency treatment personnel in critical situations. The company’s first-of-its-kind medical identification solution offers a comprehensive array of audio, video and voice-driven health and entertainment features unsurpassed in today’s marketplace in a stylish wristband design and at an affordable price point. Learn more online. Sir/Madam: Is there a way I can access the software on line to see what it looks like? Can I enter personal information such as contacts, telephone nos., PIN nos., date/time, in addition to medical information, etc. similar to the Timex DataLink watch which is no longer made? Thank you.